"Murder! Foul murder!" these are the only words that describe the scene inside the underground complex of the toy-making gnomes called the Konhengen. Murder is not what you had hoped to find, but you're not surprised, either. Your introduction to these fabled, reclusive toy-makers had ominous overtones from the outset. First, there was the abrupt and unceremonious end to their nightly gift-giving visits to the village children. Then, three children snuck off into the Taboo Lands, convinced that evil had befallen the Konhengen. And so you've travelled to a great island on the eve of the Winter Solstice to find the missing children. Instead you've found mass murder. But you've also found evidence of a secret agenda behind the gift-giving of the toy-making gnomes. 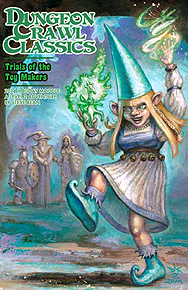 Now you must unravel the mystery of the gnomes' true purpose - or the world will suffer consequences on a cosmic scale!